Ease of use if the most important software feature for most Maintenance Managers. Our team here at C&S Companies had that in mind when we developed our Q Ware user interface (UI). Simplicity is our motto. All of the management tasks in Q Ware CMMS are designed to take the least amount of time possible. This allows maintenance professionals to spend more of their time on what really matters, maintaining assets. Event scheduler functions are available within a few mouse clicks so you can reserve locations and communicate events within seconds. The facility event reporting feature is also easy to get to and use. Select filters and data columns to render reports, export them to desired file types, then save your report settings for later use. Most people would agree that software isn't easy to setup. In fact, many people refuse to adopt new systems because they know how much work it takes to turn software into something that actually helps their operation. For this reason, the Q Ware Group here at C&S Companies takes on the setup part of Q Ware for you by creating your user profiles and privileges, uploading your asset and location information, and customizing the interface to make it unique and tailored to your needs. We also offer free training to users before handing off the final product. We make it so easy. In fact, you won't need to do anything besides login and start using the system. Your organizations data will be imported and ready to use. It's just one more reason why Q Ware CMMS is maintenance software made simple. What makes Q Ware CMMS better than the rest? We offer interface and workflow customizations FREE with each and every customer we onboard. This means you will never pay for software changes even after the initial setup. We believe in this offer because most people aren't entirely sure what their ideal system needs to include on the first day of setup. Our goal is to be flexible with your needs as they change. Any of Q Ware's maintenance management forms can be updated with custom fields allowing maintenance teams to capture data that is important to them. A few other items that can be customized include: work order statuses, automated email templates, email workflows, available service areas to submit requests to e.g. (maintenance, IT, or facilities), form messages, and company logos. How many times have you tried to get pricing on a new software package and it was so complicated that you couldn't get a real answer? This is because most vendors charge for every individual feature, user, or customization that their software offers. Not only is this confusing, it means that every time you need to "up" the software the price will follow suite. Q Ware is different. We only care about two things, how many users and what modules. One thing we can promise is that the price will never change unless you require more users or additional modules. This makes budgeting a cinch. Click here to find out what is included in a Q Ware subscription. Just like our industry leading turn-key setup, we make a big deal about supporting our customers. During the onboarding process, new customers are given a user portal to access help videos, support documents, phone numbers, emails, and online support chat. We have a support team available during normal business hours that offers immediate assistance when you need it. You'll never have to resort to asking questions on forums or waiting days or even weeks for responses from web forms. You'll be given the contact information to reach our team directly whenever you need us. The facility event scheduling module is a location management system that allows organizations to manage events, reserve facility locations, and coordinate event preparation through automated work order creation. The module also includes booking conflict checking, a location availability comparison tool, calendar event color coding, and location blocking options. It's perfect for schools and municipalities that want to organize facility utilization. 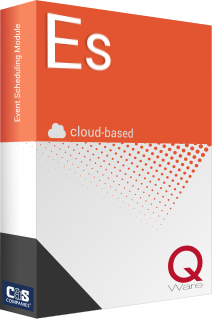 Why is Q Ware facility event scheduling software right for you? 1st It's easy to use - Clean interfaces with fewer menu options make Q Ware easy to learn and to navigate. 2nd It's simple to setup - Our setup team does everything for you. 3rd It's customizable - Event request forms, statuses, and automated emails can be customized. 4th It's low-cost - We are a perfect fit financially for small to mid-sized organizations. 5th It's supported - Support and training are free and unlimited with every subscription.